The organic personal care market has made rapid progress in the recent past to emerge as a vital offshoot of the global cosmetics sector. The organic personal care market has originated due to the growing demand from consumers for organic products in all fields including cosmetics and is likely to remain a major part of the cosmetics sector in the coming years due to rising awareness among consumers. The organic personal care market has seen the entry of several established players in the FMCG sector as well as the entry of several new players thanks to the immense commercial scope of the market and is likely to remain a promising commercial avenue in the coming years. 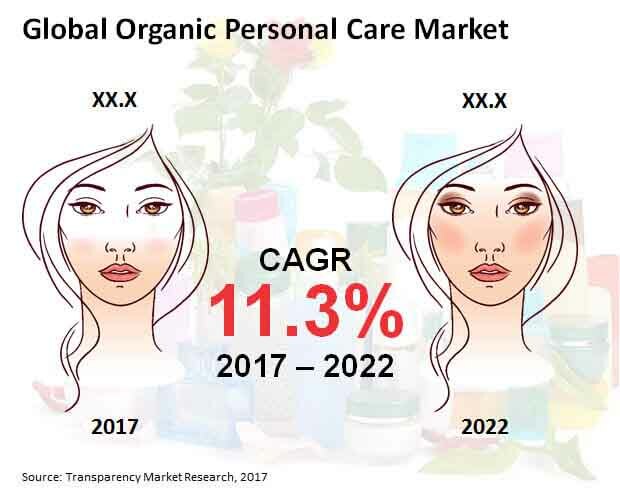 The global organic personal care market was valued at US$10.9 bn in 2017 and is expected to rise to US$18.7 bn by 2022 at a strong 11.3% CAGR therein. The global organic personal care market is segmented by product type into hair care products, skin care products, makeup and color cosmetics, fragrances, and others. Of these, hair care products are likely to remain the dominant revenue generator for the global organic personal care market in the coming years. The hair care products segment has benefited from their widespread demand and growing need due to rising pollution levels and is likely to retain steady dominance in the global organic personal care market in the coming years. The hair care segment of the organic personal care market was valued at US$3.3 bn in 2017 and is likely to rise to US$5.7 bn by 2022 at a robust 11.3% CAGR therein. Skin care products are also likely to claim a significant share in the global organic personal care market. Geographically, North America is likely to dominate the global organic personal care market in the coming years. The North America organic personal care market was valued at US$3.4 bn in 2017 and is expected to rise to US$5.8 bn by 2022, accounting for close to a third of the global market. The organic personal care market in North America is driven primarily by the widespread presence of modern sales channels, which has made purchasing organic personal care products easier. The organic personal care market is dependent to some degree on the availability of the appropriate sales avenues, since organic products have yet to become popular to the same degree as conventional personal care products. The high disposable income of consumers in North America is also vital for the global organic personal care market, as organic personal care products usually cost more than their conventional counterparts. Europe is another key regional market for the global organic personal care market due to the growing awareness in the region about the benefits of organic cosmetic products over conventional products. European consumers have been a key part of the growth of the organic products sector in recent years and are likely to continue this role with steady demand from the organic personal care market. The Europe organic personal care market is likely to be valued at US$5.1 bn by 2022, exhibiting a 10.4% CAGR in the 2017-2022 forecast period. Leading players in the global organic personal care market include Johnson and Johnson Consumer Inc., The Body Shop, Amway, Estee Lauder, Kao Corporation, L’Occitane en Provence, Natura Cosmeticos SA, The Hain Celestial Group, Kiehl’s, and Loreal SA. The report provides a comprehensive overview of the global organic personal care market by giving a thorough assessment of all segments of the market and the key drivers affecting its growth in the coming years. The 360-degree analysis of the organic personal care market provided in the report is backed by extensive primary and secondary research conducted with the help of reliable databases and interviews with active industry players. The report thus helps readers get an accurate idea of the way the global organic personal care market is positioned and how it is likely to grow in the coming years. According to Transparency Market Research, the global organic personal care market was valued at US$10.9 bn in 2017. Exhibiting a strong 11.3% CAGR over the 2017-2022 forecast period, the market is likely to reach a valuation of US$18.7 bn by 2022. The report provides readers with a clear picture of the growth dynamics affecting the market, including a detailed elaboration on the key factors driving and restraining the market’s growth. The organic personal care market is prone to fluctuations due to the variety of factors affecting its growth trajectory, and thus solid analysis is required to establish a steady presence in the market. The growing competition in the organic personal care market has resulted in a situation where failure to understand the market’s operating conditions can lead to severe failure of product lines, making this section crucial for readers interested in carving out a significant share in the global organic personal care market. The report provides a detailed discussion on the prospects of the leading segments of the global organic personal care market from 2017 to 2022. The historical growth patterns of the segments from 2012 to 2017 are also described in the report to provide a solid background for the reliable forecasts made regarding the likely growth trajectory of the segments in the coming years. The product type, sales channel, gender, and geographical segments of the global organic personal care market are assessed in the report. All the segments of the organic personal care market are profiled in the report to provide a granular overview of the market. By product type, the report assesses hair care products, skin care products, makeup and color cosmetics, and fragrances. Of these, hair care products are likely to dominate the global organic personal care market in the coming years due to their widespread demand and rising demand from the male demographic. The hair care products segment is expected to account for 30.5% of the global organic personal care market in 2022, rising to US$5.7 bn at a strong 11.3% CAGR over the 2017-2022 forecast period. By sales channel, the report assesses the figures for professional salons, online stores, modern trade channels, drug stores, specialty stores, and others. Geographically, the report examines the presence of the organic personal care market in North America, Latin America, Europe, Asia Pacific except Japan, Japan, and the Middle East and Africa. Of these, North America is likely to dominate proceedings in the global organic personal care market in the coming years, with the regional market expected to rise from US$3.4 bn to US$5.8 bn over the 2017-2022 forecast period. The report profiles leading players in the organic personal care market in order to provide readers with a clear idea of the competitive dynamics of the market. Key companies operating in the global organic personal care market include Johnson and Johnson Consumer Inc., The Body Shop, Amway, Estee Lauder, Kao Corporation, L’Occitane en Provence, Natura Cosmeticos SA, The Hain Celestial Group, Kiehl’s, and Loreal SA.